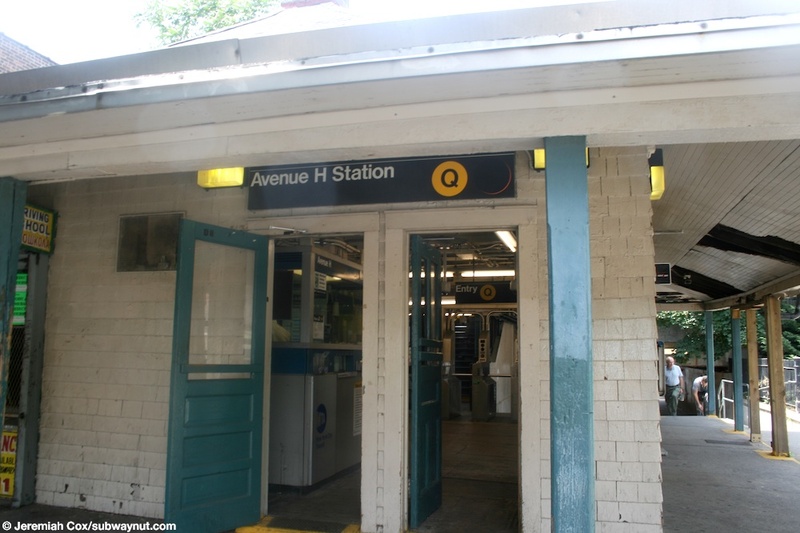 Avenue H is a very unusual subway station, like most on the Brighton Line, just north of the station (between it and the Newkirk Avenue Station), trains rise up from the open-cut trench with overpasses there in up to a higher embankment, with, streets crossing in tunnels beneath the tracks. 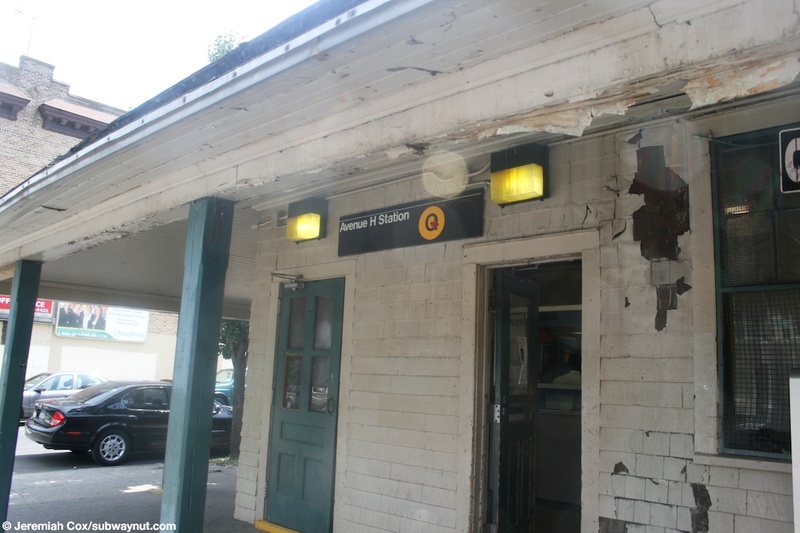 The station is only slightly raised from ground level because Avenue H can't continue beneath the tracks. The line stays this way until Sheapshead Bay, when it becomes a conventional elevated above city streets. 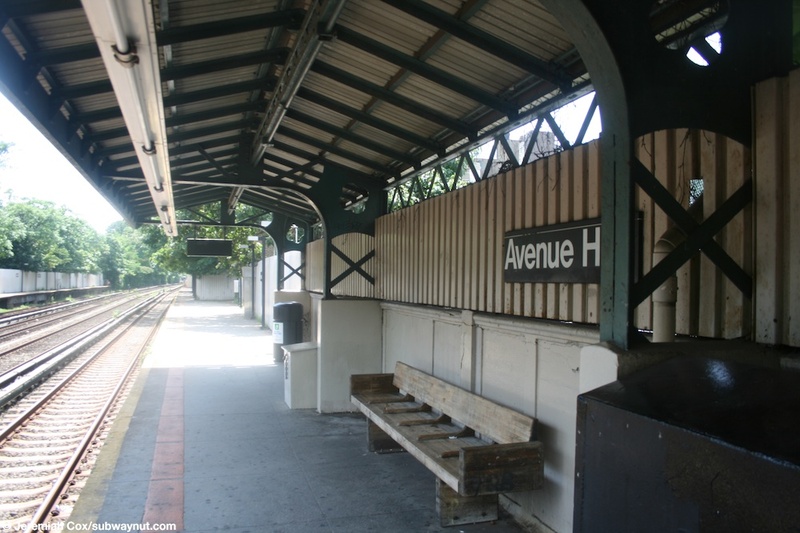 The Avenue H Station has two quite narrow side platforms for a four-tracked Brighton Line express station. These both have standard cream-painted windscreens along their entire lengths. 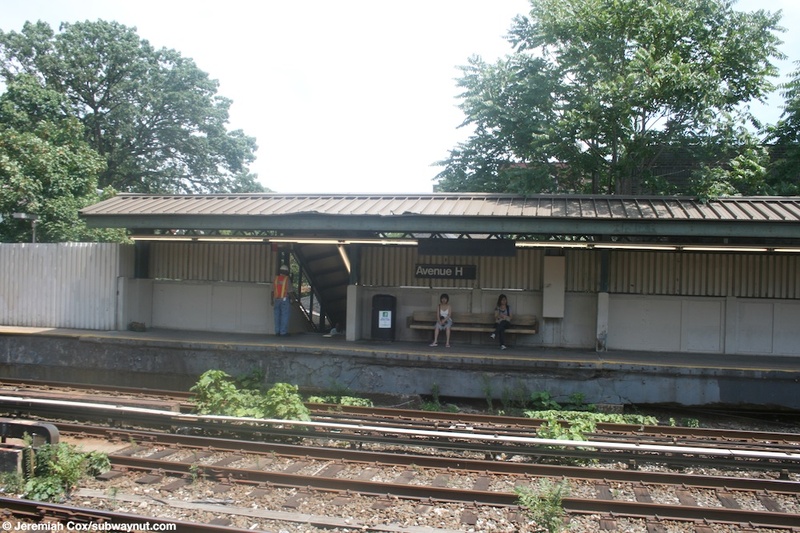 There is a canopy only towards the center of the station's platforms. 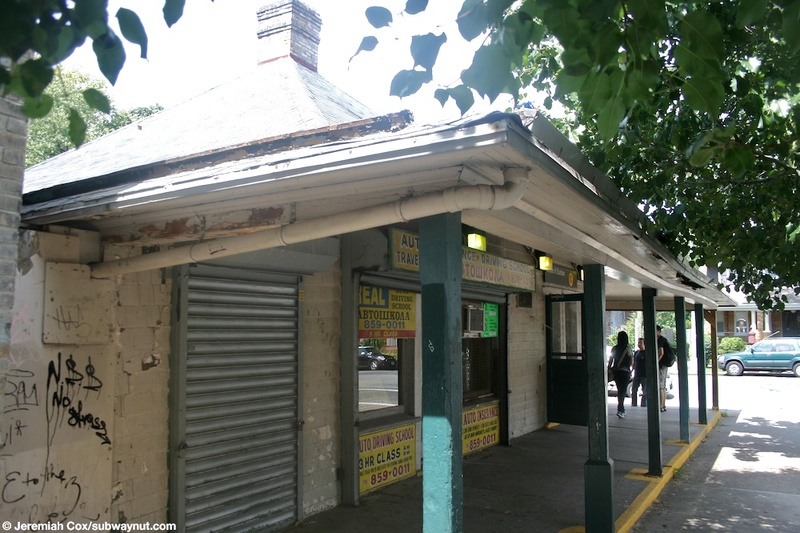 The station's main exit is currently in a bank of turnstiles in a small, shabby looking station house (that feels more like a country train station than a subway stop, its shared with a driving school) on the Manhattan side of the Right-Of-Way, at the Southeast Corner of Avenue J (that just beyond the station house dead-ends at the tracks), and a section of East 16th Street (another half-block long dead end). 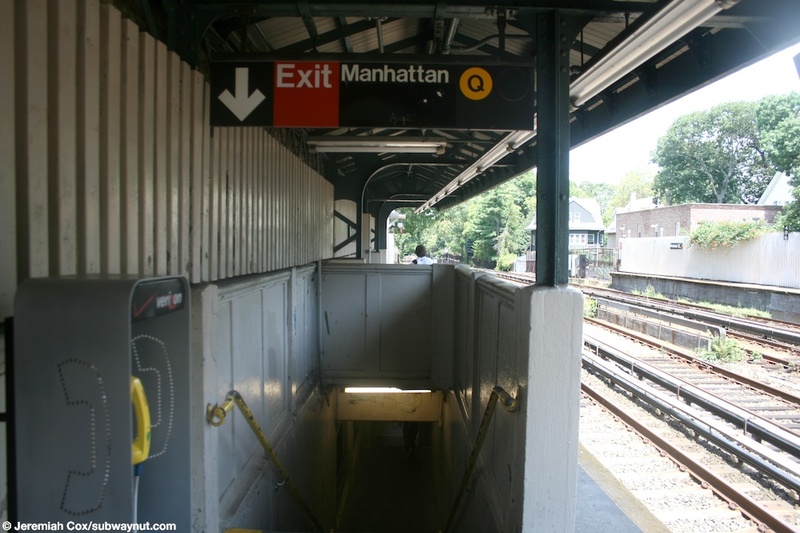 To reach the Manhattan-bound platform a short half stairway leads up to it. 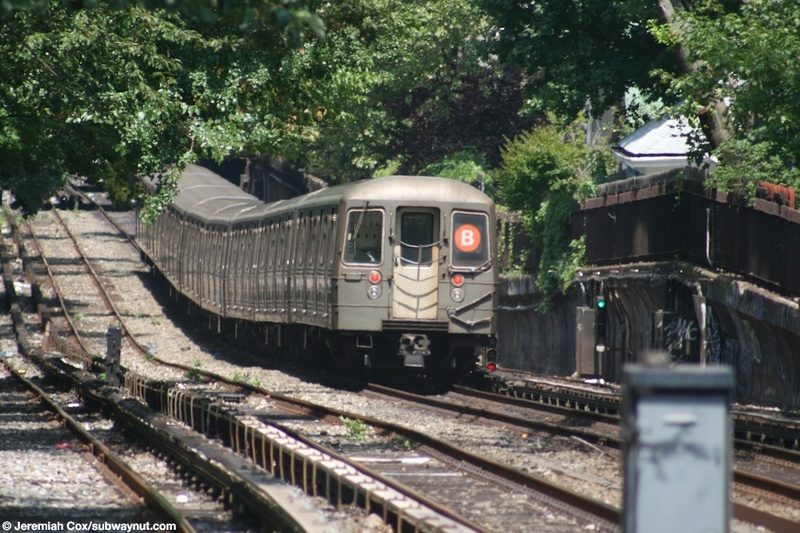 To reach the Coney Island-bound platform there's a short staircase down into a tunnel, that is also a throughway for non-subway passengers (there is a fence along the length of this tunnel beneath the four subway tracks), this tunnel, a continuation of Avenue H, leads beneath all four subway tracks before there's a High Exit Turnstile and a staircase up to the Coney Island-bound platform. 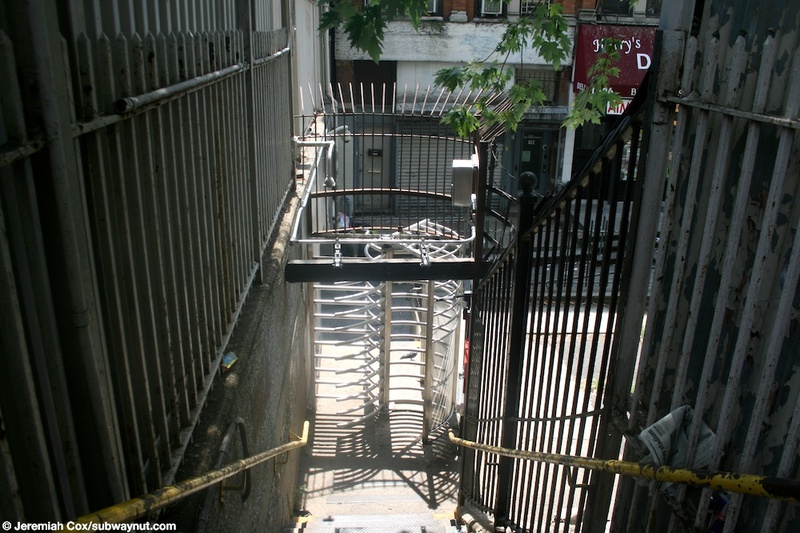 This high exit turnstile leads to the western half of Avenue H, that has also dead ended at the subway tracks (just east of a short dead-end stub of a much longer East 15th Street), and is the reason the pedestrian tunnel beneath the tracks is split in half, so pedestrians can continuously walk down Avenue H. There is a second exit from the Coney Island-bound platform; a simple staircase leads down from it to a High Exit Turnstile on the south side (the subway underpass is towards the north side) of Avenue H that has just dead-ended. 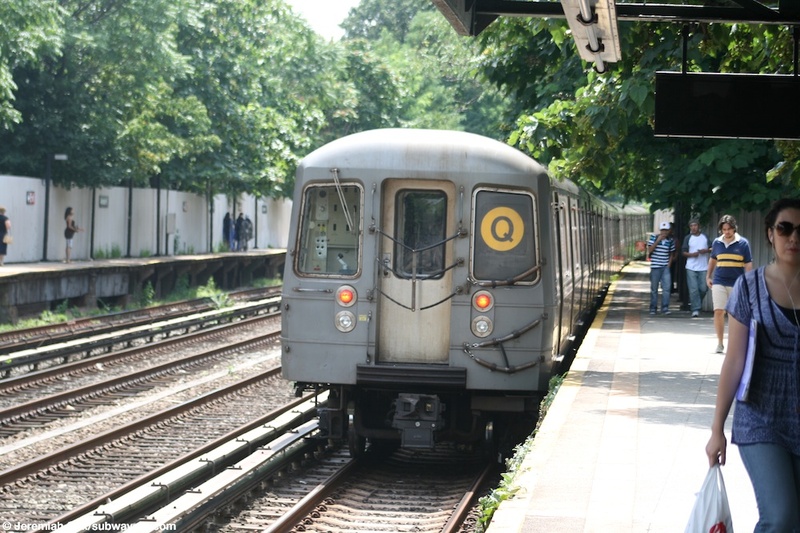 (ave_hq1) A R68A Coney Island-bound Q train begins to leave Avenue H as passengers start walking towards the exit. 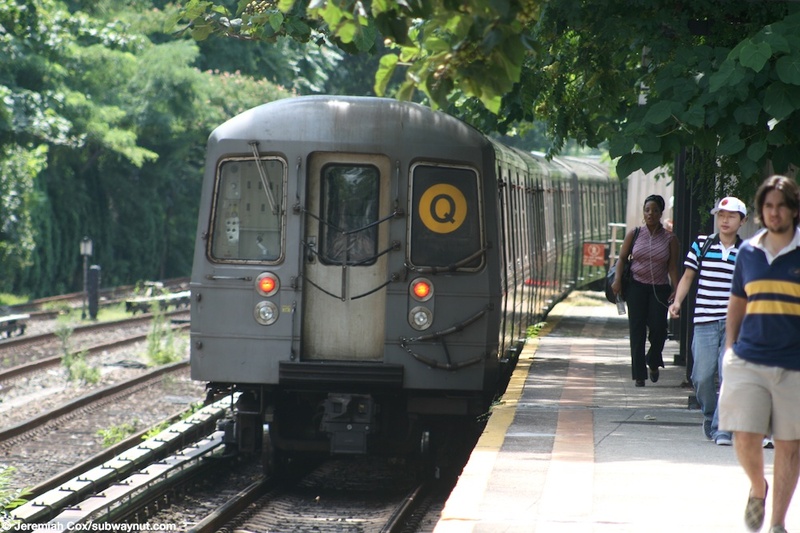 13 August, 2008 (ave_hq2) A R68A Coney Island-bound Q train continues to leave Avenue H, passengers continue to walk towards the station's exits. 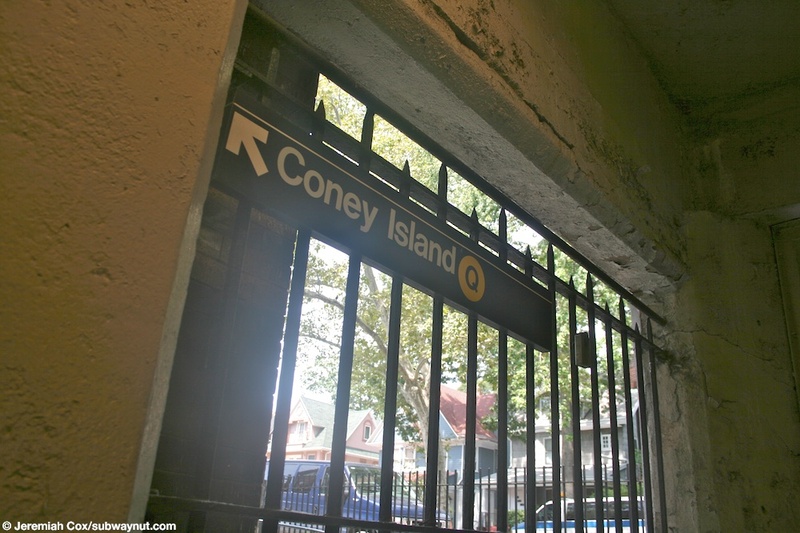 13 August, 2008 (ave_hq3) At the Coney Island end of the pedestrian tunnel a sign tells people to go up the stairs for the Coney Island-bound Q platform, single family houses of Avenue H, are visible beyond the grated 'window'. 13 August, 2008 (ave_hq4) Looking down the within fare control side of the pedestrian tunnel beneath the tracks that connects the two sides of Avenue H. The turnstiles in their small station house on the Manhattan-bound side of the tracks is visible. 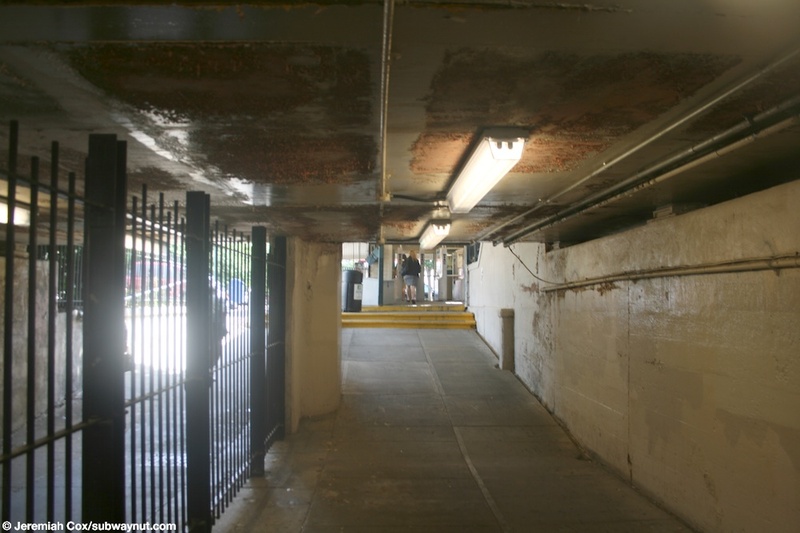 (ave_hq5) Outside of fare control at Avenue H, on the Brooklyn-bound side of the underpass beneath the tracks. 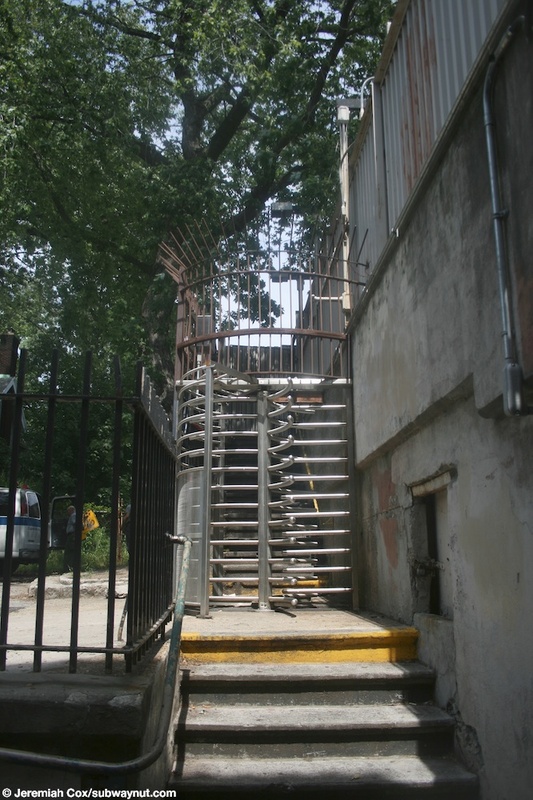 A staircase down from a secondary High Exit Turnstile is in immeadate view, as well as a High Exit Turnstile from the passageway that shares the underpass tunnel. 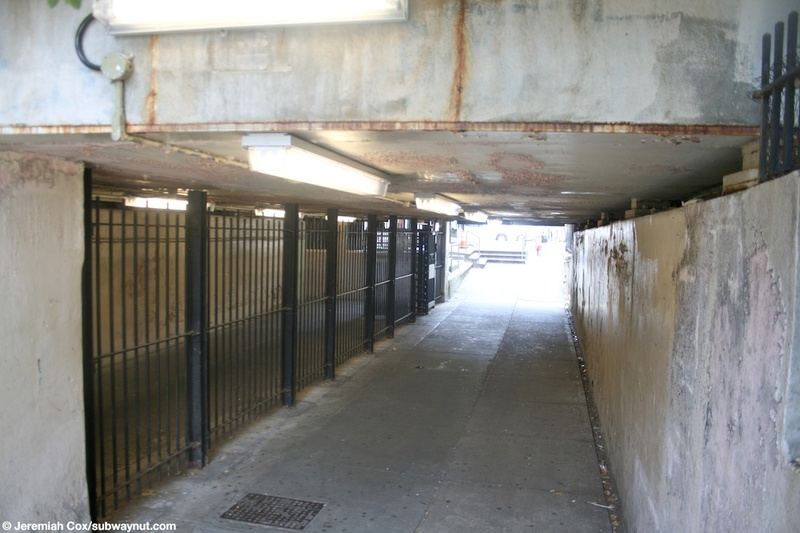 13 August, 2008 (ave_hq6) An outside view of the secondary High Exit Turnstile exit from the Coney Island-bound platform at Avenue H.
13 August, 2008 (ave_hq7) Looking down the short tunnel beneath the subway tracks that connects two disjointed sections of Avenue H open to cars. 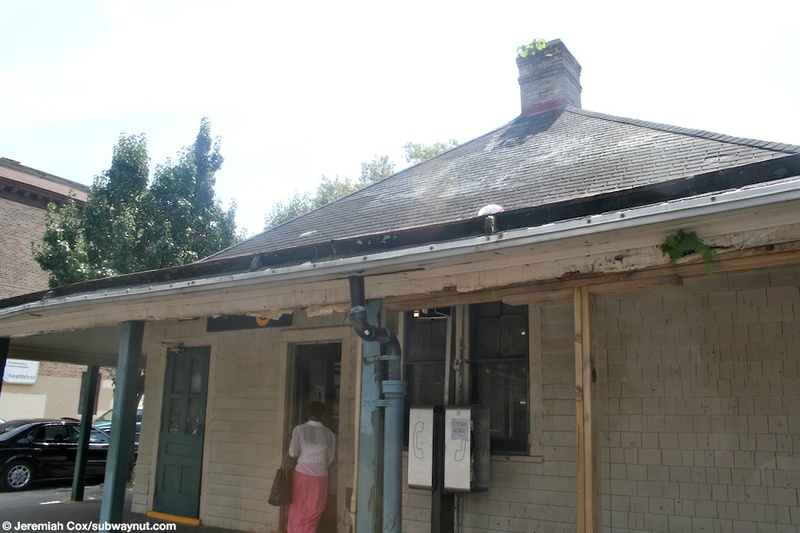 13 August, 2008 (ave_hq8) The roof and chimney of the small train station house, where fares have been paid (possibly originally tickets purchased) at Avenue H.
(ave_hq9) The doors into the whitewashed (a lot of paint is peeling) wooden station house at Avenue H.
13 August, 2008 (ave_hq10) Another set of wooden doors into the small station house at Avenue H, the token booth is visible in this view, a 90 degree angle to its turnstiles. 13 August, 2008 (ave_hq11) The station house at Avenue H is ironically shared with an Auto Driving School, (isn't the MTA offering the alternative to driving). 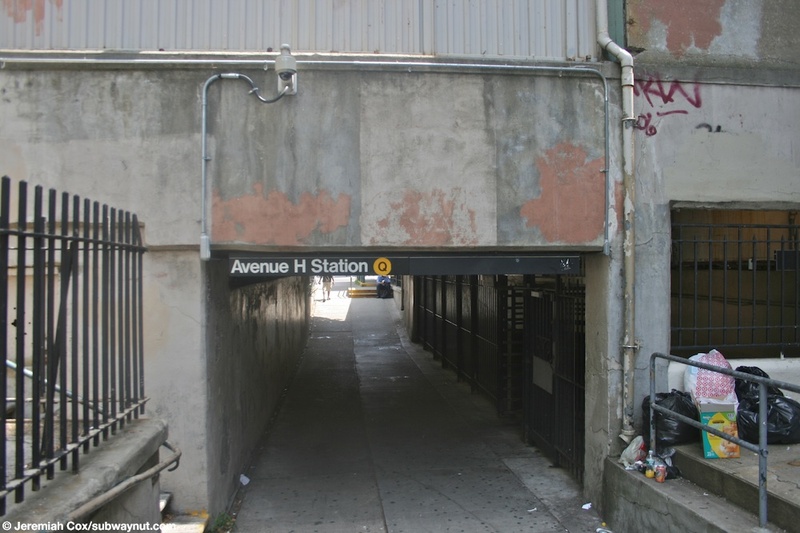 13 August, 2008 (ave_hq12) The one staircase down from the Coney Island-bound platform to the underpass to the Manhattan-bound one at Avenue H.
(ave_hq13) Looking down a relatively wide section of the canopied portion of the Avenue H Coney Island-bound platform. 13 August, 2008 (ave_hq14) Looking across to the one staircase down from the Manhattan-bound platform at Avenue H, as passengers wait for the next Q train. 13 August, 2008 (ave_hq15) R68 #2994 and a Manahttan-bound B express train have bypassed Avenue H, and go down from the embankment into the trance. 13 August, 2008 (ave_hq16) Looking down the secondary exit staircase from then Brighton-bound platform to the secondary high exit gate at Avenue H.